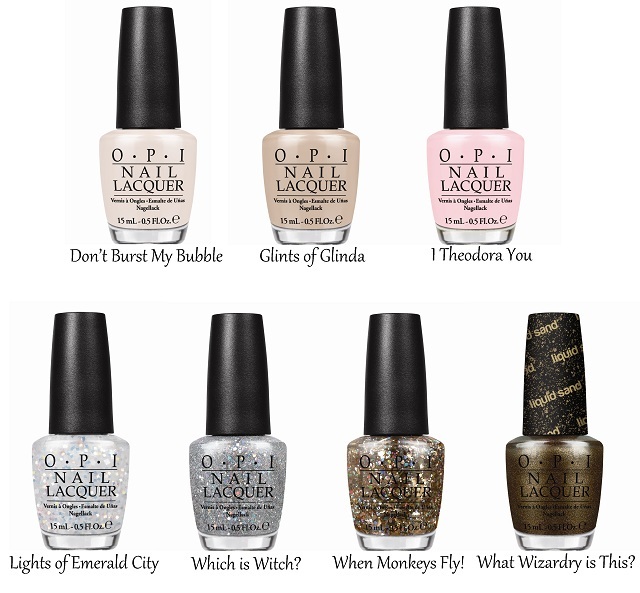 OPI announces the launch of six limited edition nail lacquers and a new Liquid Sand™ shade, inspired by Disney’s Oz The Great and Powerful. With an all-star cast that includes James Franco and Michelle Williams, this highly-anticipated film opens in theaters on March 8, 2013. “OPI is very excited to take this fantastical journey with Disney,” explains Suzi Weiss-Fischmann, OPI Executive VP & Artistic Director. “Inspired by the magic of Oz The Great and Powerful, this SoftShades collection captures the whimsy seen in the film, from glittery shades packed with white, gold and silvery iridescent confetti – Lights of Emerald City, When Monkeys Fly! and Which is Witch? – to soft neutrals in white, beige and pink – Don’t Burst My Bubble, Glints of Glinda and I Theodora You. White confetti adds city girl flair and style to nails. Don’t wake me...I’m dreaming about puffy clouds of white. I’m simply bananas for this gold confetti. Only a good witch could turn beige from meek to chic. Is this silver glitter with iridescent sparkle or the other way around? This adorable, sheer pink is bewitching on you. As with all OPI nail lacquers, the shades inspired by Oz The Great and Powerful contain no DBP, Toluene, or Formaldehyde, and feature OPI’s exclusive ProWide™ Brush for the ultimate in application. This limited edition promotion will be available beginning March 2013 at Professional Salons, including Beauty Brands, Beauty First, Chatters, Dillard’s, jcp Salons, Pure Beauty, Regis, Trade Secret, and ULTA, for $9.00 ($10.95 CAN) suggested retail for each nail lacquer. “Oz The Great and Powerful” is produced by Joe Roth, with screen story by Mitchell Kapner and screenplay by Mitchell Kapner and David Lindsay-Abaire. Grant Curtis, Palak Patel, Philip Steuer and Josh Donen are serving as executive producers. “Oz The Great and Powerful” opens in U.S. theaters on March 8, 2013. I'm just on the fence about this whole collection. Maybe once I see them in swatches, I'll get more excited. When I think of Oz, I just think of other colors - not the ones they picked! I'm waiting for the gold glitter one, When Monkeys Fly. The others are all just meh. I can't wait to get a few of these! Specifically, When Monkeys Fly and What Wizardry is This? Oh my I'm so excited for this! Hmm wonder why Rachel Weisz isn't in the picture? It's odd that they didn't do an emerald green and maybe a "wicked green" in more of an olive. I'd expect more glittery pinks and bold colors. It's oddly muted both in person and in pictures.